For potato skins, prick baking potatoes with a fork. Bake in a 425 degree F oven for 40 to 50 minutes or until tender. Cut into quarters. Scoop out the insides (reserve for another use), leaving 1/4-inch-thick shells. 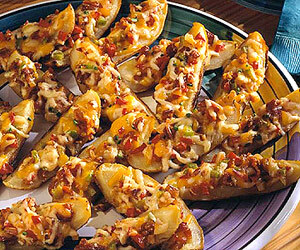 Brush both sides of potato skins with melted margarine or butter. Place cut side up on a large baking sheet. Bake in a 425 degree F oven for 10 to 15 minutes or until crisp. Meanwhile, for topping, in a medium saucepan cook the red or green sweet pepper, onion, pecans, and garlic in hot oil until onion is tender but not brown. Remove saucepan from heat and cool slightly. Stir in the cheese, crumbled bacon, and chives. Spoon onto potato skins. Return to oven and bake about 2 minutes more or until cheese melts. Makes 24. Bake potatoes; cool. Wrap and chill for up to 12 hours. Continue as directed.